There is not a lot to say about today. Mark left before breakfast to catch his train to Barcelona and has reported this arrival and expedition to the Picasso museum. I spent most of the morning in the hotel because a trip back to historic Avingnon would have left me with little time in the town. 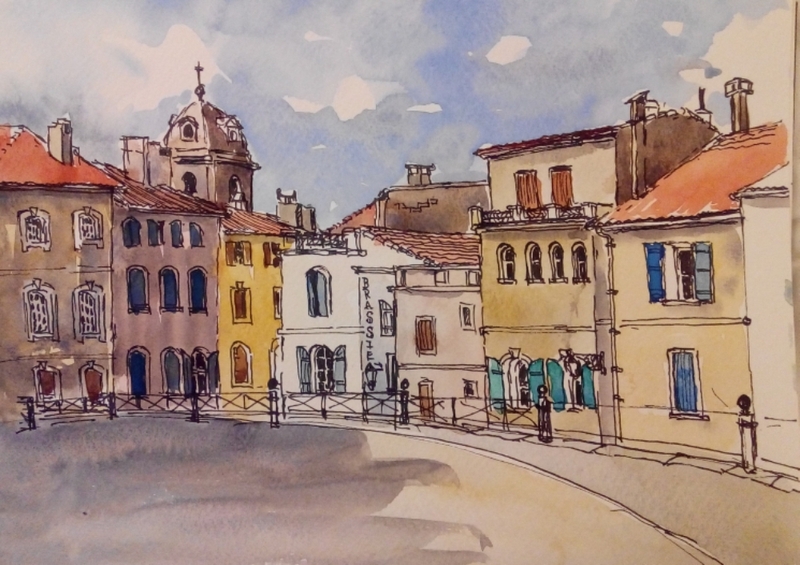 I had a few pen sketches so I coloured a couple (one above from Arles) before heading to the station. The train was a bit late but the trip was a joy, high speed trains are so much more pleasant than planes. They have more room and at times offer great views, I got fleeting views of castles, rivers, hill towns, churches, crops and forests. The train had two levels and my seat was on the top and the speed was great. I’m back in the same ibis hotel in Paris and might head out to do some sight seeing before dinner. Checking my guide book I discovered that the Musee d’Orsay had a late night on Thursday so I consulted my map of the metro and decided on a route. I wish they it could have been that easy. The first train I got on had a breakdown and never left the station, finally they announced that we all must get off. Consulting my map again I had a fair walk to a platform for a metro line which had 6 more stops to get to the same station where I needed to change to another line. That went fine until I found that the line I was to change to was not running. The next option was to walk. When I finally got to the gallery I had a pretty sore knee and was hot and sweaty. However it was great to re-visit what I rate as the best gallery in the world. I had forgotten what an extensive collection of impressionist paintings they have. There seemed to be dozens of paintings by Pissaro, Renoir, Sisley, Monet, van Gogh, and the list goes on. Most pleasing to me were Renoir’s “Ball at the Moulin de la Galette” and one of Vincent’s self portraits. A different route back to my hotel and it was after 10pm do I decided it was too late for dinner. 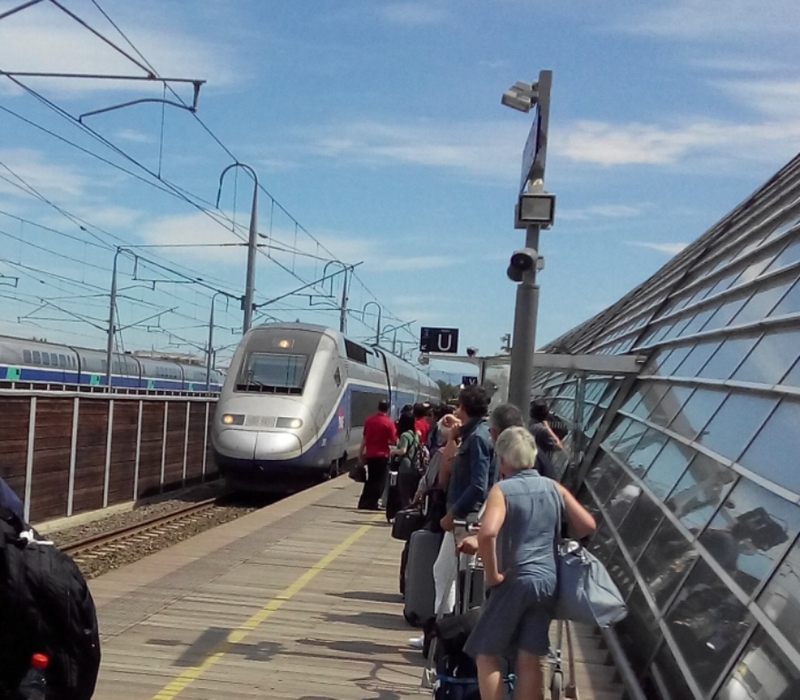 Hi Quiliam, Enjoyed your sketch of “near arena at Arles”, and the photo of the modern high speed train. You are now going solo, but hope you catch up with Royce, and friends in Paris as arranged. Yes, a great gallery, Quilliam. Glad the impressionists were open for viewing. When I was last there they were refurbishing the Impressionist Gallery! Your description of the metro has made me think I may need to get a taxi from my hotel to my point of departure when I go to St.Mont Michel as I need to be there by 6.45 am. Can’t risk missing the coach!!! More neat paintings. I’ve just been reading that Turner was a great pen and wash person.